Clarets boss Sean Dyche is disappointed at the severity of James Tarkowski’s suspension. Tarkowski was charged by the FA with violent conduct after an incident involving Brighton’s Glenn Murray in Saturday’s goalless draw at the Amex Stadium. But while he accepted the charge, Burnley argued that the three-match suspension was excessive - an appeal which was rejected by an Independent Regulatory Commission. Tarkowski will miss the games against Spurs, Manchester United and Huddersfield Town, and Dyche said: “First of all I think it must be pointed out we don’t condone it. “At the time I was annoyed with Tarky, but having seen it after the game, the reason we’re a bit surprised is you can clearly Murray grab his hand, which has five pins and a metal plate in. “We put that to the panel but they said it shouldn’t be reduced. “That incident can’t be put in the same bracket as some that get three game bans. 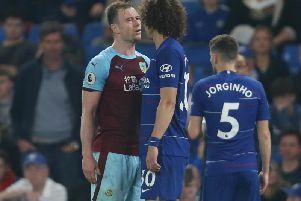 Tarkowski suffered a hand injury in conceding a penalty moments before aiming an elbow into Murray’s ribs, and Dyche added: “James has five pins in it. He had damaged it before but Murray knows it. “He just happened to grab his hand – maybe it was by accident of course. Asked whether he has spoken to Tarkowski about the incident, Dyche admitted: “I have only had a word with Tarky to say ‘what was that all about?’ When I saw it on video I said ‘he’s right and he was 100 per cent telling the truth’. I trust my players. But they said no, it’s still three games. “It is a very low contact situation, to use the word violent is something, but it has to be deemed something. “The amount in modern football that doesn’t get looked at, of course it is disappointing. And I say again I don’t condone it. “The good side is with the plate and screw in it means it’s going to be strong so he can still work on his fitness, for all he has to watch knocking it.